The San Jose Blog: Magic is Coming to the San Jose Improv Tomorrow! Magic is Coming to the San Jose Improv Tomorrow! 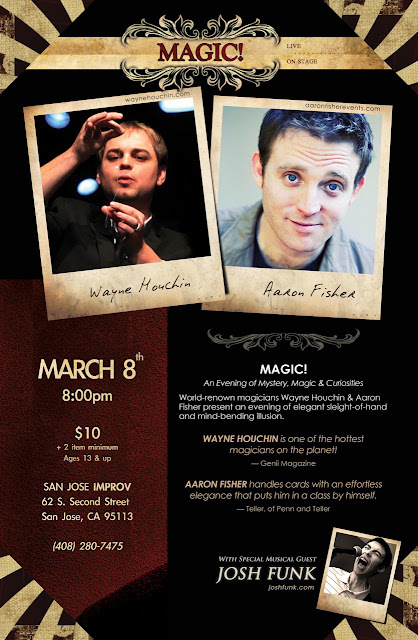 World-renowned magicians Wayne Houchin and Aaron Fisher will present an evening of Mystery, Magic & Curiosities at the San Jose Improv on March 8th at 8 PM. This all-ages* show features cutting edge sleight-of-hand magic along with special musical guest Josh Funk. Wayne Houchin worked with Criss Angel on the hit TV show Mindfreak, made headlines for predicting the exact outcome of the Super Bowl and recently made history in the Dominican Republic by stopping time for the entire nation – on live national television. Aaron Fisher is a regular performer at the world-famous Magic Castle in Hollywood and is widely regarded as one of the greatest sleight-of-hand artists in the world. His best selling magic book The Paper Engine has been hailed as a modern day classic. *The poster says ages 13+, but management has decided to open the show up to younger children (10+) as well.